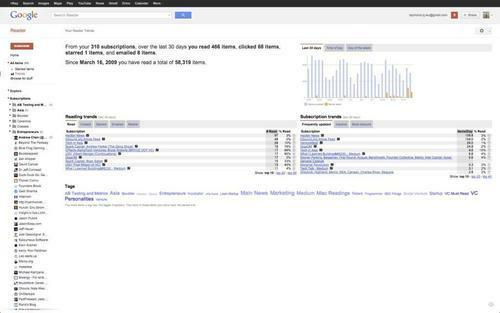 Since March 2009, I read 58,319 items on Google Reader. Instead of mourning about the death of Google Reader, I wanted to share my feeds. I had 310 RSS subscriptions, and really valued the VC blogs and numerous Lean Startup and Customer Development posts that helped me grow in the last 4 years. When I first got interested in the VC and startup world, I read a lot of Brad Feld and Fred Wilson. They were prolific and amazing writers. They also held nothing back. Mark Suster was great at breaking down a topic from both an investor’s and entrepreneur’s point of view. Chris Dixon was always inspiring. Nivi and Naval’s Venture Hacks had far more information than I could possibly digest. Steve Blank and the early days of Eric Ries’s Startup Lessons Learned blog shaped the way I thought about building products and entrepreneurship. More recently, I read slightly differentiated stuff. I am a lot more interested in Growth Hacking. I love Andrew Chen’s blog posts, anything put out by the KISSmetrics’ team, Neil Patel’s amazing hacks. For VC’s point of view, I absolutely love Andrew Parker’s The Gong Show, Bryce Roberts’s Bryce Dot VC, and Albert Wenger’s Continuations. Somewhere in the last few years I also started reading every essay Paul Graham published. RSS has taught me everything. These awesome writers have opened their most inner thoughts to the world, and I am the beneficiary. Over the last few years, I’ve shared my RSS feeds with friends, who are interested in startups and the VC world to give them a jumping start. Today after cleaning up my feeds to six categories: Growth Hacking (14), VC Must Read (6), VC Personalities (57), Entrepreneurs (48), Lean Startup (24), Main News (3), I’ve hosted it on Dropbox to share with people who want to read more about startups. You can import it into Digg Reader by signing in and selecting “OPML import.” I hope the feeds come in handy. Ps. Today is the last day Google Reader lets you export Google Reader data through Takeout.